Our Heated Sock Liners feature a polyester-cotton blend utilizing our Finewire Heating Technology on the bottom of the foot and wrapping around the top of the toes. The Socks plug into the bottom of your Heated Pants. If you don't have Heated Pants they will be hooked up to a "Y" Harness that you will run down your pant legs and plug into your Controller. 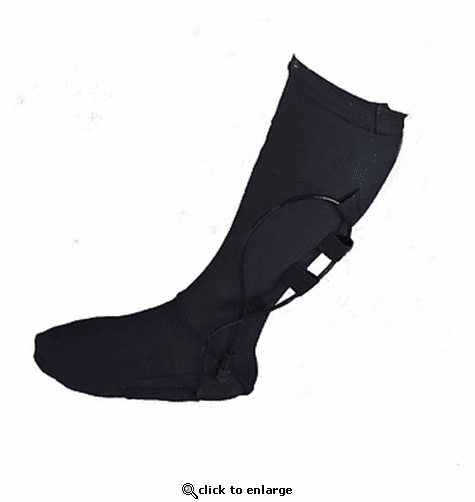 This is a sock liner, we recommend wearing a thin sock underneath to help with wear and tear, cleaning and burns. The Socks have a pull tab on the back of the heel to help pull them over your foot. ***Do Not operate heating clothing without a temperature controller. Do Not leave heated clothing plugged in while unattended. Fire and burns could occur. California Heat 12V FINEWIRE Power System: Here at The Warming Store we test a lot of heated gear. California Heat provides top-notch heating performance that riders have come to respect in a very short period of time. We highly recommend California Heat's Motorcycle Heated Clothing to help you stay warm and comfortable on your adventure. WARRANTY: When you purchase a California Heat garment, the Finewire heating elements and wires are under warranty for the life of the product. All other components of the garment are covered for factory defects in materials and workmanship for a period of one year from the date of the first retail purchase. This ONLY applies to the original owner purchasing from an Authorized Dealer (Including The Warming Store). Batteries are under warranty for ninety days, and should be charged regularly. Temperature controllers are covered for two years. A receipt or valid proof of purchase is required for all warranty claims. California Heat offers the lowest prices, best heat and highest quality in heated liners, gloves and socks for motorcyclists. Our products are heated with Finewire, a very light and small heating yarn, for a warm comfortable ride. Our liners are designed to look great on and off the bike. The battery harness has an inline fuse on the positive (red) lead.The fuses that are included are Violet for 3 amp, Peach for 5 amp, Brown for 7.5 amp, Red for 10 amp and Blue for 15 amp, Yellow for 20 amp. The amp draw below is rated at 12 volts. The output on your motorcycle will be between 13.8 and 14.2 volts. To calculate your true amp draw divide the amp draw on all items you are going to hook up by 12 them multiply by your motorcycle volt output. Example: gloves 2.4 plus jacket 6.4 = 8.8 / 12 = .7333 x 14 = 10.99. You need to use the next higher rated fuse (blue for 15 amp). Connect the red lead to the positive terminal on your battery and the black lead to the negative. Zip tie the coax under your seat on the left side if you do not intend to install a panel mount port. The red lead to your temperature controller hooks up to the battery harness under your seat. The white lead on the temperature controller is for your jacket and plugs into the white coded plug at the bottom inside pocket of your jacket liner. The black lead hooks up to the black plug next to your jacket plug in your jacket. To turn your controller on, after you have started your bike, hold the button down for three seconds. There are five settings on the controller: 1 is 20% power, 2 = 40%, 3 = 60%, 4 = 80% and 5 = 100%. To turn you controller off hold the button down for three seconds. If you would like the same settings for your next ride, do not turn off controller! Just unplug it and the memory will kick in! Your heated clothing gets very hot and can cause burns that you may not notice while riding. You should not leave your settings on the controller at 100% except to initially warm up you gear. You need to turn down the heat to a comfortable setting after that, for instance 3 for 60% power. Disconnect battery terminals (negative first). Connect battery harness to battery, positive (+) to fused side and (?) to negative. An accessory plug can be used to power the unit. With motorcycle running, plug output cord into the garment then plug the input cord into the battery harness cord. Adjust heat level by turning knob clockwise to increase heat. Turn the knob counterclockwise to lower the heat. The knob clicks when turned to the "off" position. A dual controller has two knobs to control two separate garments on the same user. WARNING: Do not use the dual unit to control two separate users. The dual unit is intended to control two separate garments on the same user. The controller has Green or Yellow (dual unit only) LED for normal operation.